TESTED BY EXPERTS. RATED BY CUSTOMERS. Two independent testing labs – AV Test and AV Comparatives – tested BullGuard Internet Security running on Windows 10. Against a range of threats, phishing, malware, infections and hacker tactics, BullGuard scored 100% every time. ​Your Computer... the photos, music, documents and all of your personal information you store on it, and the places your computer can take you on the Internet are precious. No-one wants to spend hours maintaining and configuring computer security, you need to know that you and your children are safe from complex threats that the Internet can now throw your way, so it’s vital that you have Internet security that rigorously protects your files and your identity from cyber criminals and the latest attacks. The good people at Bullguard recently sent me their Internet Security to try out and review...so I naturally took up the opportunity to try it out for the first time in years! 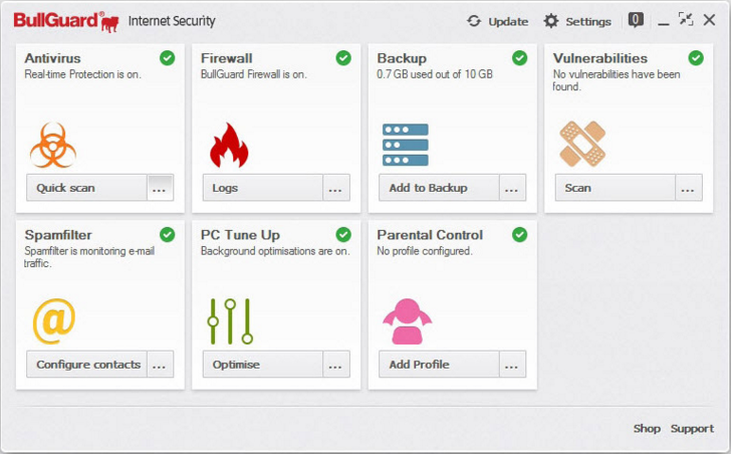 The first thing you will notice about Bullguard Internet security, is the ease of installation. It didn't take long at all, and the update process after install was painless too...you just click on the update button and it does just that in minutes. Configuring it was as easy as 1-2-3...it basically does it for you. When the installation and updates processes have finished, it with proceed to configure internet access for your programs automatically, and informs you of which programs it is granting access to as it goes along. Very simple and straight forward!. 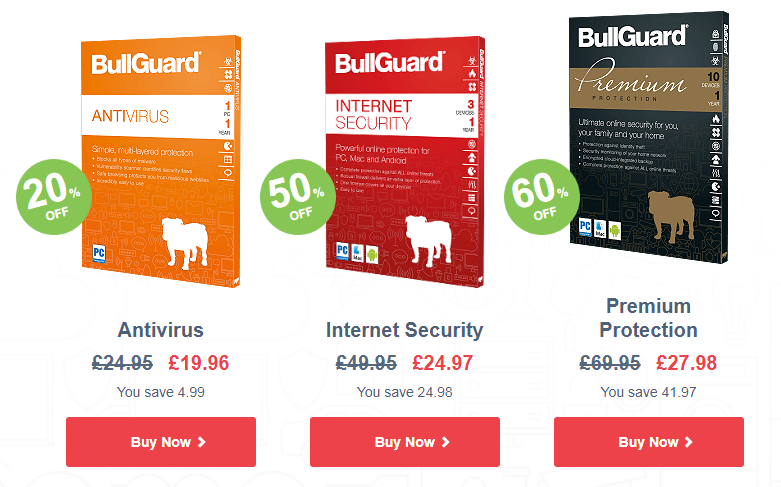 Bullguard Internet security is starting to look an ideal security solution for the novice user, it seems much easier to install than the others I have tried, but, for the experienced user there is a plethora of settings you can change to grant access / block and configure programs. So it really does cover a broad range of users. After the initial configuration of Bullguard, it was a simple case of looking through the options to decide what i wanted to try out. Firstly I asked Bullguard to perform a full scan of my PC. This didn't seem to slow my PC down at all and whilst this process was in operation, I continued with my work and actually forgot after 3 hours that it was still scanning. It took a while to scan in total, but this is an indication of just how in-depth Bullguard scans your PC or Laptop, also, I have 8 drives to scan! I was surprised to find it had found some issues and automatically quarantined the threats (small as they were, they were still threats). Previous scans from another well know Antivirus program didn't pick these up - so all good so far. ​After the full scan had completed, I decided to try this (from within the control panel), it didn't take long and removed unwanted temporary internet files, windows files and broken registry entries. All of these will help slow down your PC or Laptop, so its a good idea to run something like this every week or so. Bullguard Startup manager is a good bit of kit...it allows you to control what programs are allowed to start when your PC or Laptop does. I use a dedicated program to do this, but Bullguard Internet security has this feature built-in, so I don't really need the stand-alone program any more (I also have a separate PC tuneup program too, and Bullguard already has this function built-in too). If you have a problematic program for whatever reason, you simply go to your Bullguard control panel, go to PC tuneup, look for Startup manager on the right and remove a tick next the offending program, and it will not start. It's very simple. There are many more components that make up Bullguard Internet security (see below for some) which I'm not going to go into just now, but I'm very satisfied with what I've seen over the past week or so. After trying this, I'd like to thank Bullguard for allowing me to do so and I highly recommend it to the complete novice and professional user alike.